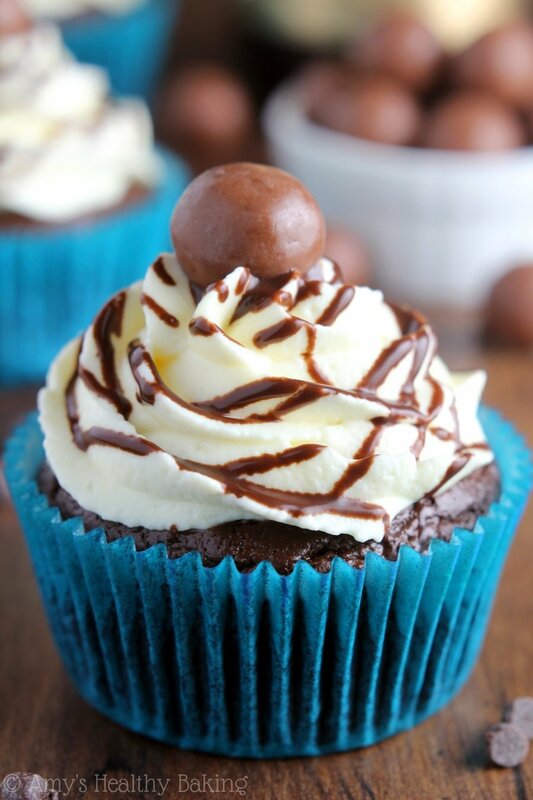 Rich chocolate cupcakes made with beer, topped with vanilla frosting, chocolate syrup, & malted milk candies. 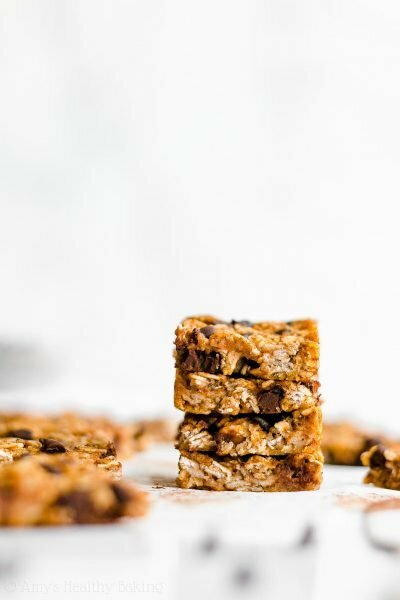 Easy, impressive & a true treat! On a rainy afternoon last week, Trish, Amy, and I drove into San Francisco for an exclusive culinary tour hosted by Negra Modelo. We started at a “Mexica-tessen,” where the owners welcomed us into the kitchen to watch ladies cook hand-flattened tortillas made from the freshest, most flavorful masa. They simply pulled off a ball of the dough, pat-pat-patted it thin, and laid it down on the griddle to bake. While we stared, a gentleman wheeled over a cart full of ingredients. He cleared off a space on the grill before demonstrating how to cook their famous huarache. It looked like two elongated tortillas filled with beans and cheese, then topped with fresh cabbage, salsa, queso fresco, and cilantro. For the carnivores, he also threw on juicy tidbits of steak. Trish and I split one, and my goodness… You guys know how much I love dessert, but that savory dish was my favorite thing of the entire day! Hot, cheesy, salty, spicy… And oh so addictive. I want to order one every time I ever visit the city! Next, we walked a few blocks down to a butcher shop. The owner, an older gentleman, captivated us with his story of “flap meat.” Have you ever tried this cut of beef? Although I can’t tell the tale nearly as well as that sweet man, he basically explained how here in the US, we never used to separate that part of the cow. It was hidden underneath fat and tissue, so back in the ’70s, butchers tossed it aside for ground beef. However, his father was a butcher in Mexico, so this man knew that he could cut away those layers to reveal the meat below, which Mexican cuisine used to make carne asada. When he went to the factory and began flapping his arms up and down to strip away the fat, someone asked him what he was doing and the name of the cut. Because he didn’t know how to translate the Spanish word, he simply called it “flap meat” because of his hand motions, and the name stuck! The third stop on our tour took us to a bakery, and Amy, Trish, and I immediately went wild. After the owner’s son walked us through the names and fillings of the pastries, we each grabbed a tray and loaded it up with as many treats as we could fit! Cheesecake, empanadas, cookies, scone sandwiches, jelly rolls, croissants and spirals… We must have walked out with one of everything. And yes, I sampled all 7 pastries in my bag as soon as I got home! Throughout the evening, we bloggers took turns at the Twitter vending machine (yes, that really exists!) winning various prizes like beanies, customized cutting boards, and Negra Modelo beer glasses, while Chef Rick Bayless occasionally shared tips about a variety of ingredients used in Mexican cuisine. 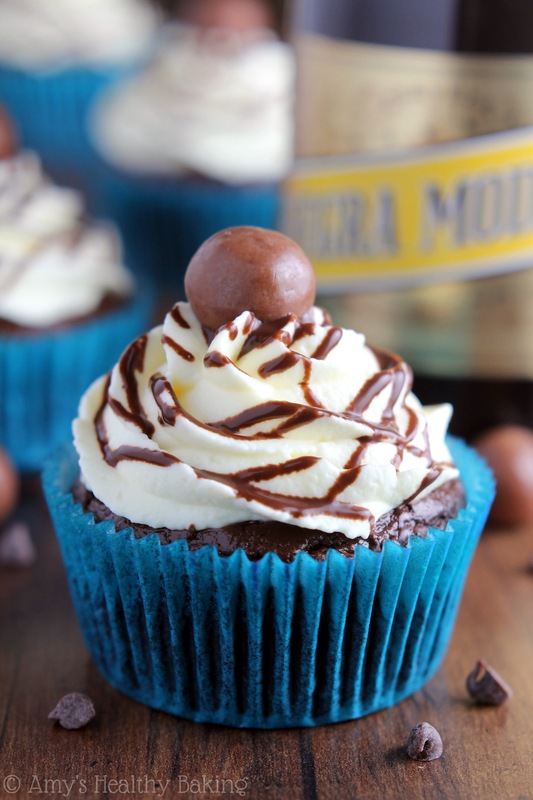 However, when he mentioned his restaurant’s chocolate chile Negra Modelo ice cream, I immediately knew that I wanted to make my own chocolate dessert with the beer, so I created these Malty Chocolate Beer Cupcakes! 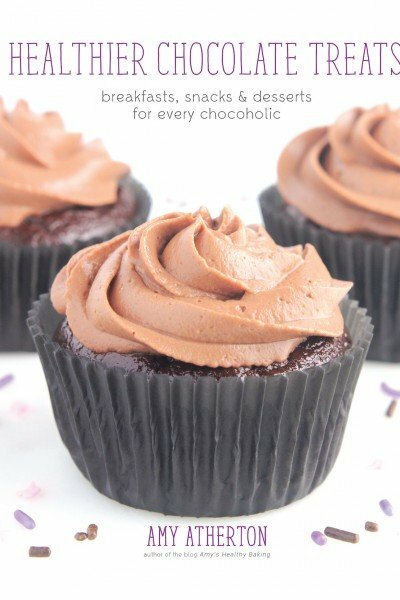 They start out with my favorite chocolate cupcake recipe (the one readers have proclaimed is better than a bakery’s!). 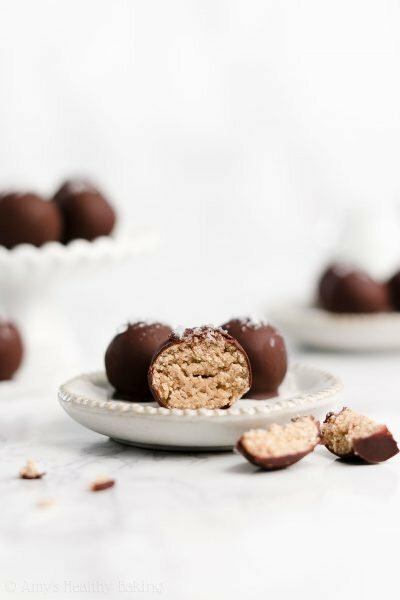 It’s extremely rich, incredibly decadent, yet still unbelievably healthy. I substituted Negra Modelo in place of the milk and decreased the sugar by just a touch because of the sweetness of the beer. If you take a little sample of the batter, you’ll taste the beer’s tangy flavor on your tongue at the end. Most of the alcohol bakes off in the oven, but you can still detect that tiny tang and subtle hint of caramel in the finished cupcakes. Note: Negra Modelo is made by slow roasting the malts, which brings out their sweeter, almost caramel-like notes. It’s classified as a Munich Dunkel and isn’t quite as bitter as other beers, so it’s perfect for baking into desserts and treats! 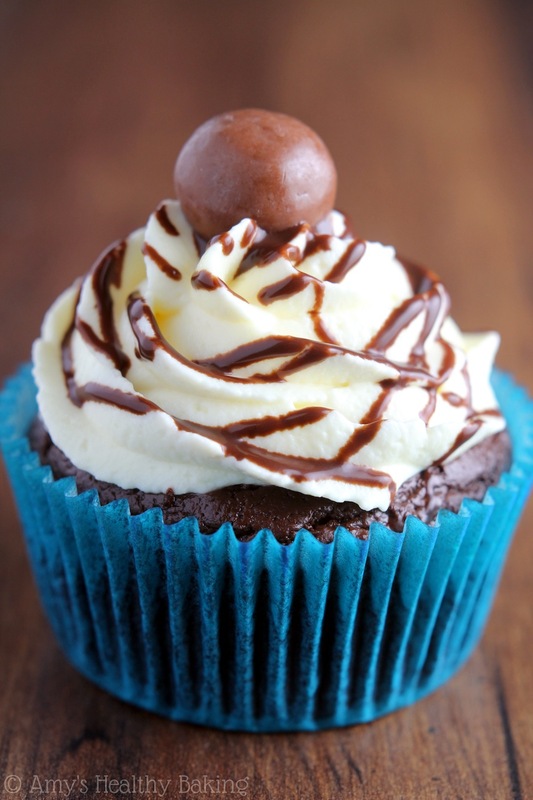 Because low fat cupcakes tend to stick to paper liners like superglue, make sure you spray the liners twice before filling them with batter. If you forget and only spray once, that’s okay! Simply seal the baked cupcakes inside of an airtight container for a day, and that’ll help release the liners from the cake. 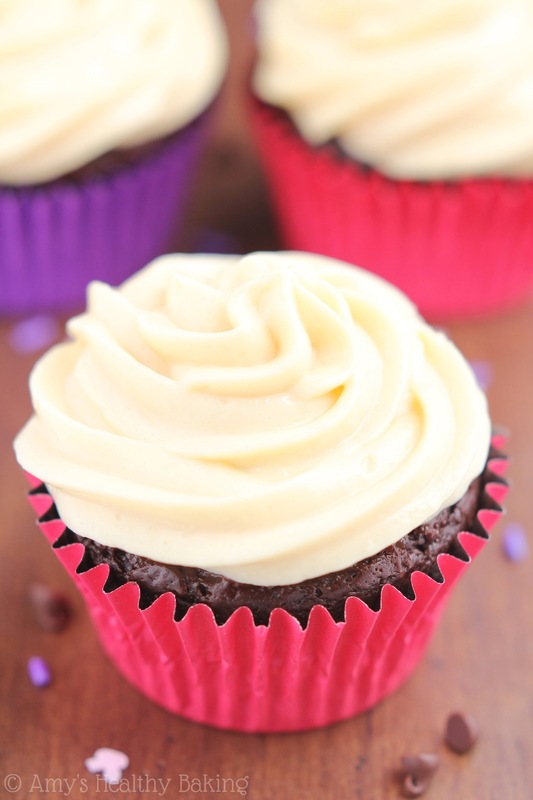 To complement the rich chocolate, I mixed up my favorite light and creamy vanilla frosting. 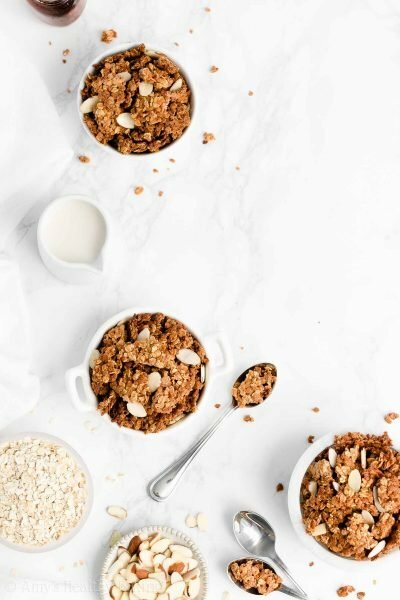 It’s one of the simplest you’ll ever make! Just Greek yogurt, instant pudding, and sweetener. The instant pudding thickens the yogurt, and after chilling, it has the same consistency as regular buttercream but none of the raw powdered sugar taste. I’ve actually eaten a bowl of the leftover frosting with a spoon… For breakfast! 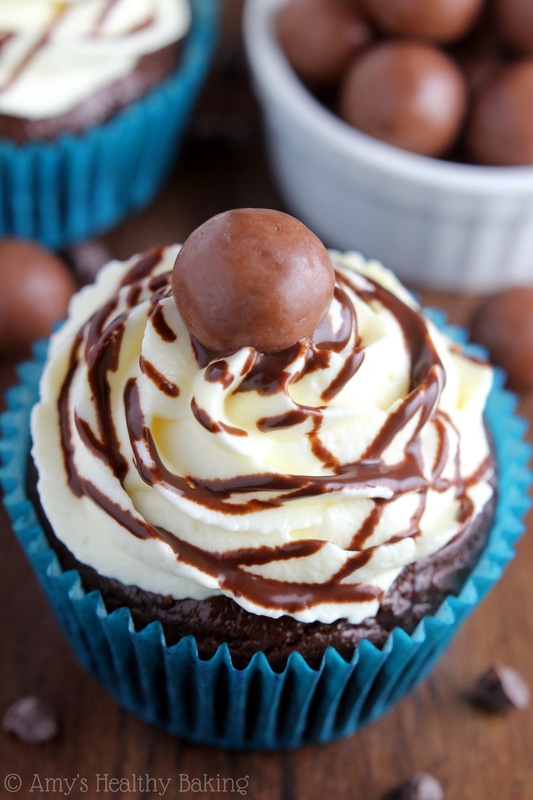 To finish the cupcakes, add a little drizzle of chocolate syrup and a malted milk ball candy on top. 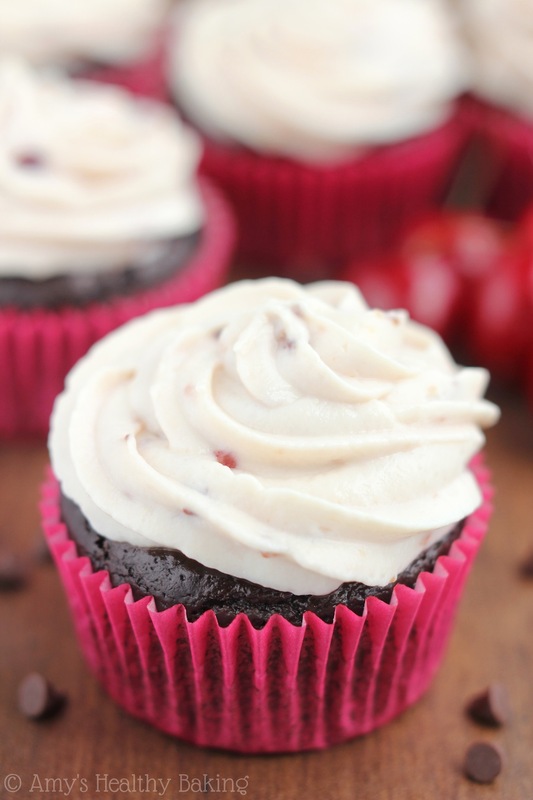 It brings out the malty flavors in the cupcakes! For the most elegant presentation, drizzle the syrup in a spiral, starting at the tip of the frosting then circling around and around. Don’t worry about making a mess; that’s half the fun! 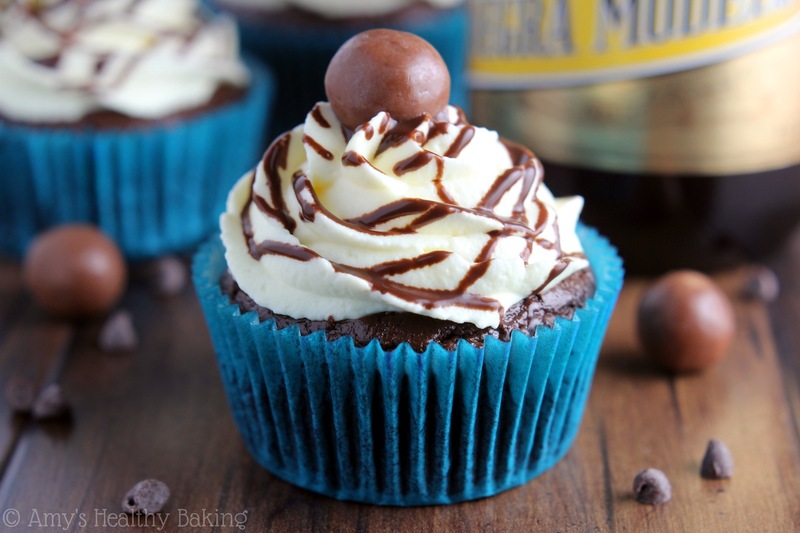 My parents stopped by on their way home from their cabin this weekend, and I sent along one of these Malty Chocolate Beer Cupcakes with them. My dad loves beer and even used to brew his own, but my mom… Well, she generally prefers her chai lattes! However, she loved the cupcake’s richness and sweet tang, and she and Dad nearly contemplated driving back up just for more! That’s the best compliment ever. 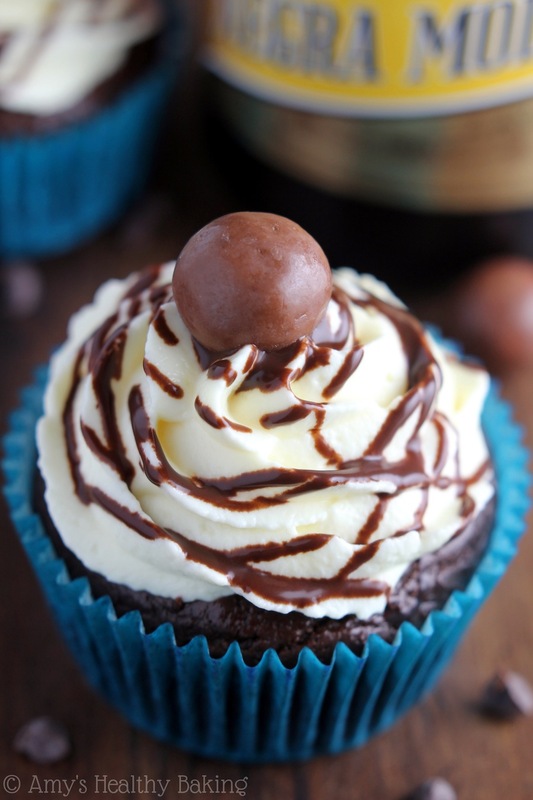 These cupcakes are incredibly decadent and look very impressive, but they’re really easy to make! The chocolate syrup & malted milk candy on top bring out the beer’s sweet malty notes. They’re best if eaten the same day they’re made, but store any leftovers in the refrigerator for up to 3 days. Divide the batter between the prepared liners, and bake at 350°F for 18-20 minutes, or until a toothpick inserted into the center comes out clean. Cool in the pan for 5 minutes before turning out onto a wire rack to cool completely. While the cupcakes bake, prepare the frosting. Beat together the yogurt, instant pudding, and sucralose with an electric mixer for 2 minutes, or until thick. Cover and chill for at least 2 hours. To assemble, add the chocolate syrup to a zip-topped bag, and snip off one corner. Pipe the frosting on top of the cooled cupcakes. Drizzle with the chocolate syrup in a circular, spiral fashion. 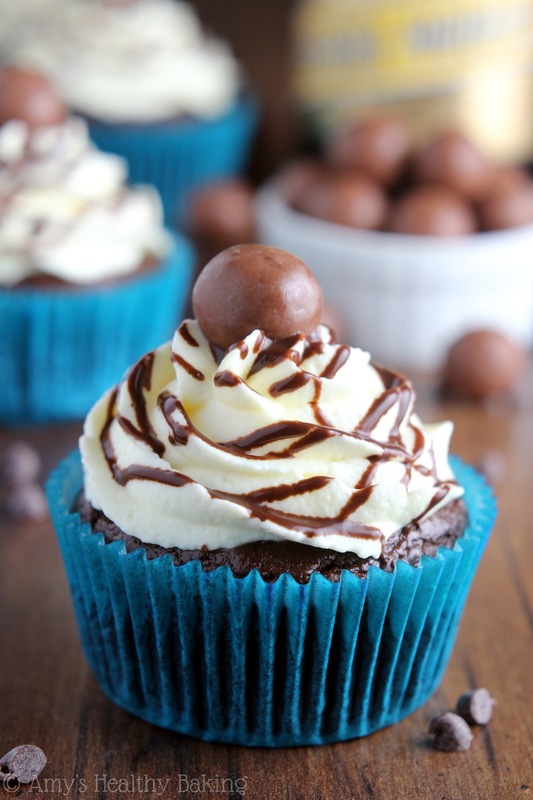 Top each cupcake with a malted milk ball candy. 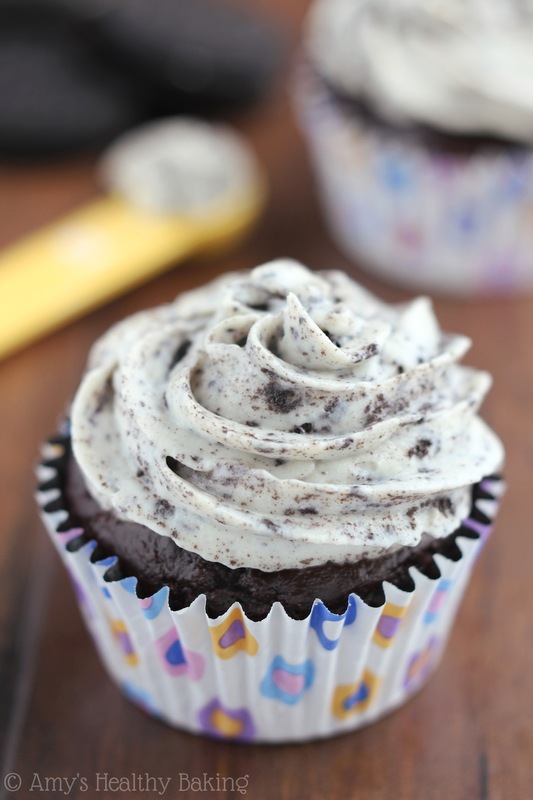 Notes: If using paper cupcake liners, spray them twice with the cooking spray. If using metallic liners, only spray once. Do NOT prepare the instant pudding according to the package’s directions! 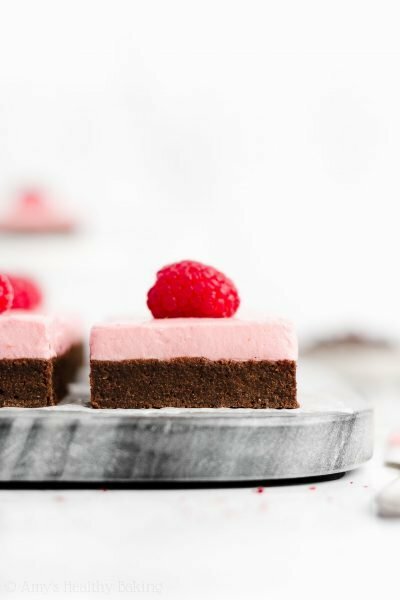 Just use the powder to make the frosting. *This post was sponsored by Negra Modelo. As always, all opinions, text, photographs, and recipe are my own. Such a delicious evening! Still daydreaming about the huaraches and fish tacos. And now I’ll be dreaming about these cupcakes. Brilliant! Hopefully you won’t have to dream anymore Amy! 😉 Those huaraches and fish tacos… Oh my gosh, I SO wish we had those up here!! It’s basically worth dealing with the parking just to eat them again! I don’t have that kind of beer. Can I use any kind as a substitution? Thanks! I’m sure you can find a substitution Maria! Negra Modelo is classified as a Munich Dunkel, so if you can find something else in that category, it should work perfectly. You want a beer that’s dark, sweeter, and not quite so bitter. 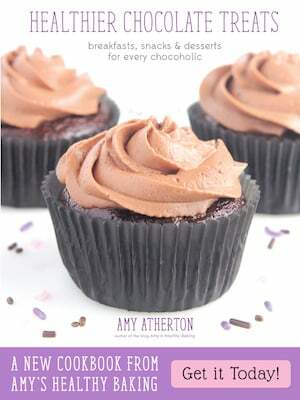 I’d love to hear what you think of the cupcakes if you try them! Thanks so much! I’ll let you know when I make them. I’m a big fan of chai lattes so if your mom came back for seconds on these, then I know I would too! Mm, that frosting looks so SO good. Pinning! Thank you so much Mary Frances! 🙂 I’ve totally been converted to chai lattes too… They’re dangerous! My stomach is so jealous of your trip to SF! I would have tasted all 7 of those pastries too. Can we recreate your tour with you as the guide?? These cupcakes are SO CUTE. 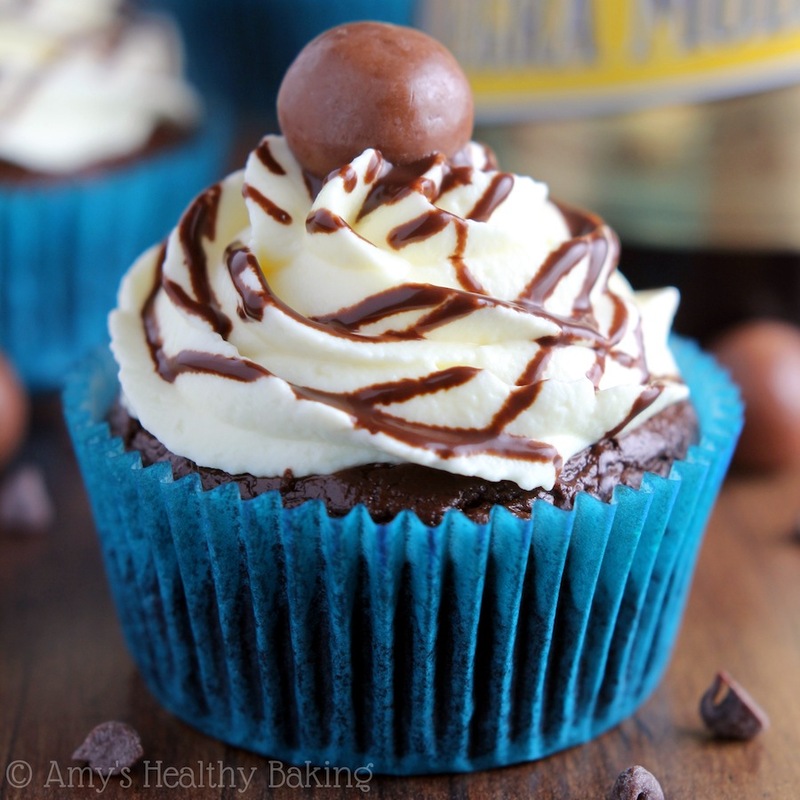 I love the bright blue wrappers and you frosted them so beautifully! YES! Let’s do it!! You live so close to SF, so it’d totally be a breeze. We have to do that sometime soon! 🙂 And thank you for the sweet compliments! I actually won the cupcake liners in a giveaway from Sweets & Treats Boutique. She sells the cutest ones, and I want to buy them all! Be still my little heart! These cupcakes are out of this world, Amy! 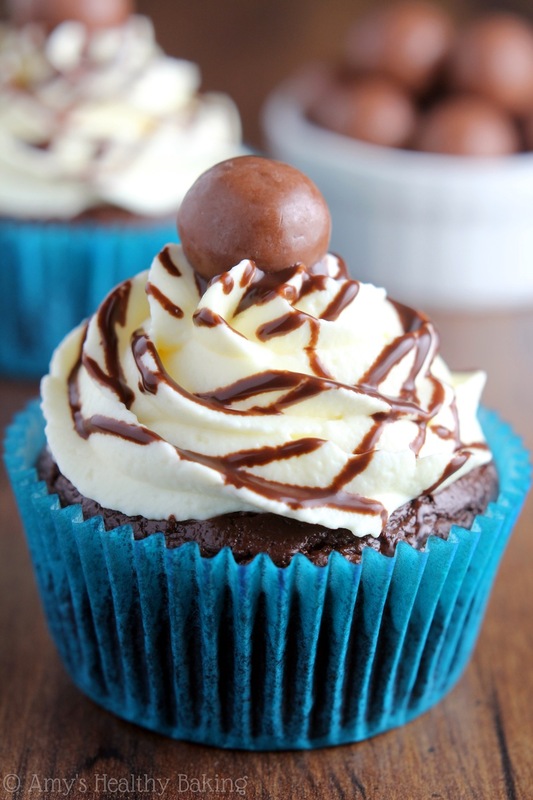 These cupcakes are INCREDIBLE.. loving all that delicious frosting ontop especially!